Sometimes, the best defense is a good offen—a gorilla. Sometimes the best defense is a gorilla. Overwatch has gone through a rapid series of meta shifts since the end of last year. Tanks had their time in the spotlight, followed by a more balanced 2/2/2 era, and now we’re starting to see the vast majority of pro teams overload on DPS. Thinking about what that could mean for your average ladder squad might make you cringe, but it shouldn’t. As we discussed last week, by taking the stress off of your healers and tanks and placing it on the other team you’re in a much better position to keep up the momentum of a strong push. Dare I say, it might be time to bench Reinhardt and take Winston out for a spin in most situations—even on defense! Let’s take a look at some examples of this from OGN Apex Season 3, and what you can learn from two of the best teams in the world. When you’re defending a point, it’s natural to consider what composition will give you the best wall. That usually consists of a modest 2/2/2 for most people, with Mercy and Reinhardt being the fulcrums. There’s nothing wrong with that since it’s rather safe. But safe can often lead to predictability, and being predictable spells the end of your success against good players. That’s when the Reinhardt dance ends, and the Winston jumping begins. Miro is one of the best Winstons in the world, and this is part of the reason why. His confidence and ability to adapt to the situation makes him vital to Lunatic-Hai’s success. This deceptive little ambush is something that you can work into your ladder strategies with minimal effort. By tucking Winston in the corner and stacking your DPS off to the side, you’re putting your team in a position of power right from the start and foregoing the arch stalemate altogether. Having your back to an environmental hazard also eliminates any concerns you might have about about getting flanked. Not even Lucio or Pharah boops are much of a concern as long as you’re able to jump out of the way or back to safety, which Winston, D.Va, Tracer and Genji are all capable of. 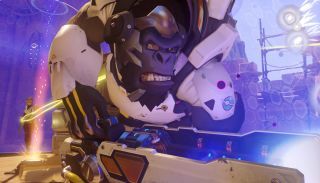 High level teams are not winning in spite of fielding a Winston, they’re winning because Winston fits the current meta like a glove. Once the fighting starts, you’ll have no line of sight issues, and even if the other team goes around the tower, you’re fast enough to get on the point in less than a couple of seconds. From here, it’s all about zoning, which is what the Winston and D.Va combo is best at. When you stagger Primal Rage and D.Va bomb, the other team isn’t on the point. Moreover, that gives your DPS and even your support some time to open up on enemies who are scattering. In any case, your primary goal isn’t to kill with your ult as Winston, it’s to keep people off the point. Jump in and out of the fighting as necessary, just stay alive and knock people away. Once EMP goes off, Fissure drops a perfect shield next to the bunker which compounds matters for Lunatic-Hai. Those retreating not only have distorted audio and impaired abilities, but any assistance coming in from the spawns has to deal with a temporary obstruction as well. It’s not something you see everyday, but that’s that kind of flexibility that Winston can give you on defense. High level teams are not winning in spite of fielding a Winston, they’re winning because Winston fits the current meta like a glove. Yes, I know we’re not all pro players and that sometimes pro tactics don’t work the same on the ladder. However, being aware of what those better than you are doing can improve your game, and, most of all, make you a more tolerable teammate. As Overwatch develops, two facts will always remain: you have five people to work with and minimal time to get work done. Being stuck in old or false paradigms will only get you so far. To see more excellent Winston play, check out KnoxXx this Friday as Rogue takes on Mighty AOD at Apex.